On Sunday, October 18 we could not get up to Miaz summit. This Sunday June 5, if the weather is ok, we’ll climb to this sammit in the background of the Aravis. 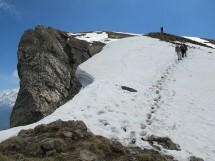 The summit of 2336 m, itself, dominates the Combe de Tré La Crot, Combe Des Fours and Niard. It also offers a beautiful view over the eastern side of the Aravis range. From parking de Perret 1276m (Cordon), we cross the Plateau de Bénés et Cabin de Petite Pâtre to arrive at Col de Niard. We climb then la Combe de Trè Le Crot until the summit. Back: if the snow and / or frost are not too annoying, we descend into the Combe des Fours and get back to the Col de Niard. If not, same path. There are no major technical difficulties, if it's not some steep sections. Cumulative elevations: 1175m. Distance: 14 km. For experienced and sporty hikers. Do let me know whether you will come by car and your mobile number.